You're not alone, you have a gun on some levels, which is useful. It’s weird how games grab you. Some games I like because of a marketing campaign. Other games I like because I liked their demo. Others through word of mouth & others through the fact you happen to like the franchise (see Street Fighter II on the Commodore 64). Cosmic Causeway on the other hand: it was discovered on a covertape. I can’t remember the actual covertape, and I couldn’t remember the other two games on the covertape, but the game Cosmic Causeway (which was the later game on the tape, which meant you had to load the first game on the tape first) – got played more than the other four games, as well as a fair few commerial games I bought. Cosmic Causeway was an odd game. 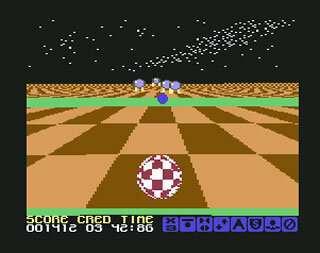 You played a ball (that looked a lot like an Amiga ball), who could jump a little bit, fire lasers on some levels, and move at a fair piece. The “Causeway” was an endless brown walkway in space (the “Cosmic” bit I guess). However after a while, the walkway changes colour, from Black (holes), Red (slow down), Light Blue (reverse controls), Blue (jump high), Green (speed up) and the annoying Purple (bounce back). You think this is it, but in later levels, you have baddies & annoying walls to contend with. Walls are when the game becomes night on impossible. You weren’t alone, each level had a glowing disc which you can collect for credits, so much so they can be used for powerups. With the exception of a big jump & a multiplication of your score with 3. The levels (I believe) was 26 in number, and on each level was new things introduced. It’s quite like Super Mario Brothers 3 – in that new things are seemingly introduced each level. Throw that originality, that one more go (you didn’t die, but you had to beat a clock to the end zone), and a thumping music track that goes well with the game, and you have the game I was excited to relive at r3play. 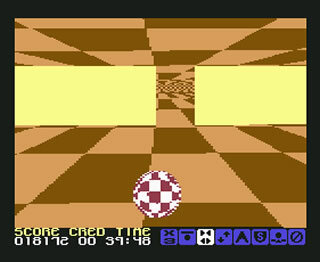 Yes, Cosmic Causeway was discovered on a covertape, but by goodness it was in my top 10 games played on the C64.